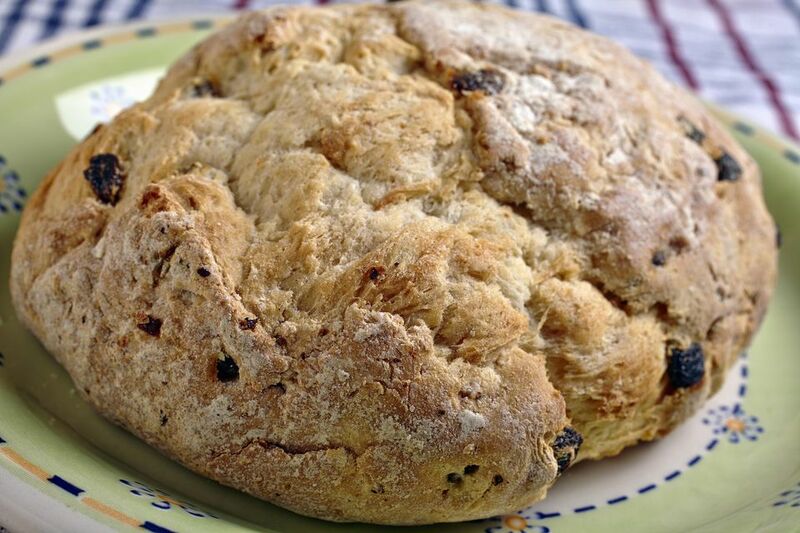 Here's a really good Irish soda bread recipe that is quick and easy to bake. The sour cream and buttermilk make the bread very tender and moist. This bread is the perfect accompaniment to a meal of corned ​beef and cabbage on St. Patrick's Day, or as a meal accompaniment anytime. It is fabulous served warm from the oven, with butter melting into it. You can also make this with different dried fruits. Try dried cranberries or cherries, dried currants, or dried finely chopped apricots. And yes, you can omit the caraway seeds if you'd like. Try this bread toasted, spread with whipped honey or some raspberry or strawberry jam. It's also delicious as french toast. Preheat oven to 350F. Spray a 9-inch round cake pan with a nonstick baking spray containing flour and set aside. In a large mixing bowl, combine the flour, sugar, baking powder, baking soda, salt, and caraway seeds and stir to combine. In a small bowl, combine the eggs, buttermilk, and sour cream and beat until smooth. Stir the egg mixture into the flour mixture just until flour is almost moistened; stir in raisins. Knead the dough right in the bowl about 10 to 12 times. The dough will be soft and sticky. Place the dough in the prepared pan and pat down gently, forming a rounded mound. Cut two 4-inch long and 3/4-inch deep slashes to form a cross in the top of the bread. Bake the bread for 65 to 75 minutes or until it is browned and sounds hollow when you thump it with your fingers. Remove the bread from the pan and place on a wire rack to cool. Serve warm. You can also bake this Irish soda bread in two 8-by-4-inch loaf pans. Spray the pans with a nonstick baking spray containing flour. Bake at 350 F for 45 to 55 minutes or until a toothpick inserted in center of loaves comes out clean, the loaves are dark brown and sound hollow when thumped. Alternatively, you can bake it free-form on a cookie sheet. Just gather the dough into a ball with floured fingers. Shape it into an 8-inch ball on a greased cookie sheet. Bake at 350 F for 45 to 55 minutes until golden brown. The bread will flatten out a bit, as there is no pan to keep its shape, so it bakes for less time.